We packed up the Bongo (Mazda Bongo side converted camper van) and headed to Portsmouth to catch the ferry to Bilbao, Spain. From Spain we then drove as much as we could without the boys going psycho in the van (a couple of hours a day), camped out en-route and slowly made our way to central Portugal. We seriously could not believe it when we arrived in central Portugal. It’s not at all what we’d imagined. As a Brit when you hear mention of Portugal you think of the beaches and sunshine. 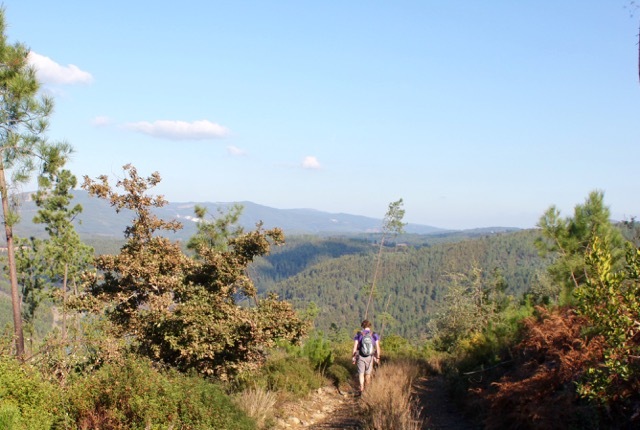 What was surprising was the endless undulating horizons of pine and eucalyptus forests. Absolutely stunning. Our house (I say our house, because the owner said we should refer to it that way, move in, feel at home etc.) was amazing. We were used to a small and very overstocked 2 bed flat and found ourselves in a palatial 4 bed house with a huge garden and orchard. We had never had a garden before, or outside space, the kids absolutely loved it. We were in a remote area, 10 kms to the nearest village, with a few neighbours dotted nearby. We were well and truly in the sticks and in our element. We took full advantage of the orchard’s produce and harvested the olives. Cooked up a storm with fresh ingredients from the local markets. The boys played outside in the sunshine.